The sixth seal of the Roboplastic Apocalypse crashers to the ground as I discuss the first year of the mightiest robots and mightiest vehicles ever! Listen in astonishment as my plan to do a short twenty minute show on the inception and introduction of the GoBots franchise evolves into part 1 of what will probably be an hour and a half long Gobotastic Podtrilogy! Are you a man or a Machine Man? Why Tonka mightily dumped the name "Machine Robo"
Mighty Puppies! Lion-O + Cooler = Cooli-O? *Also, at the 15:22 mark I originally said "Tonka in 1983" but I accidentally cut off the "3" during editing and I'm too lazy to go back and fix it right now. Today, I caught up on unearthing the other broken seals of the podcastalypse. Spurred on by robologia, I sped my way through the night, intent on reaching Acme Comics, central florida hub of gobotivity, cybertonia, and shogunivity. However, it was closed. I arrived home, laden with defeat. Yet, what was in the mail, but Psycho, the super gobot, the first gobot of my adulthood. However, he had no eyes. I'm sure that the tonka or machine robo or whatever guys were pretty busy, but forgetting to put eyes on your robot is a major error. So I took him apart, snapped out the cockpit, glued in some rhinestones, and I now have a glorious future machine that can optically spectrolate the cosmoverse. If they ever make an action figure of you that comment should totally be the bio card. Plus your figure should come with a mini customized Psycho GoBot accessory. 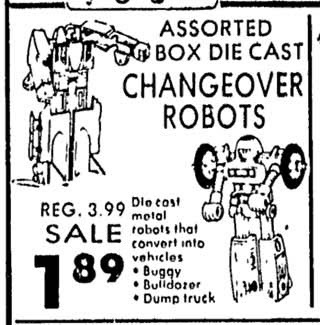 Cool episodes on the Gobots. I give the podcast a plug at my blog today. Please check it out! Well thanks, I appreciate it!